What do science fiction, cross-dressing aliens, and choreographed dancing all have in common? The makings of the 1975 cult classic, The Rocky Horror Picture Show, of course! While most seventh graders were swooning over Leo DiCaprio and slow dancing to “Un-Break My Heart, ” I spent my weekends memorizing the words to “Dammit Janet” and practicing the moves to the Time Warp. By college, my RHPS fangirl status had progressed to midnight screenings, sequined tap dancing costumes, and throwing rice at movie screens. In Rocky Horror, costumes take center stage. When the actors aren’t clad in 1970’s wedding pastels or their skivvies, they’re clad in a cacophony of burlesque-style undergarments, sequins, mouse ears, spiked leather jackets, and bedazzled leotards. Whether or not you’re planning to attend a midnight showing, The Rocky Horror Picture Show will provide all the campy costume ideas you’ll need for a truly happy Halloween! 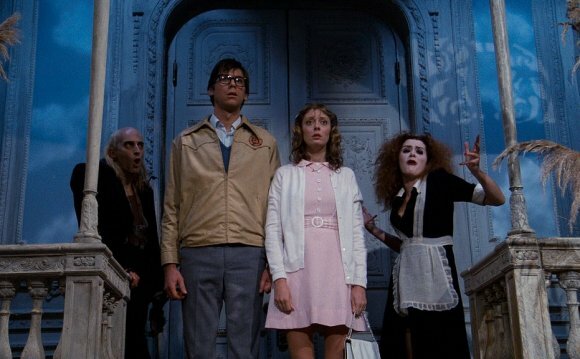 Starring Susan Sarandon, Barry Bostwick, and Tim Curry — oh, and Meat Loaf — the 1975 film adaptation of the British rock musical was meant as a parody of the science fiction, horror, and B-movies that marked the late 1940s through the early ’70s. The story centers around Janet Weiss (Sarandon) and Brad Majors (Bostwick), a clean-cut, newly engaged couple who gets lost in the woods with a flat tire on a cold November night. Seeking shelter at a nearby castle, they inadvertently interrupt the Annual Transylvanian Convention, a party populated by strange guests, including tap dancing groupie Columbia and two sinister servants, Riff Raff and Magenta. As the partygoers dance to the Time Warp, Brad and Janet attempt their escape, only to be intercepted by Dr. Frank-N-Furter (Curry). After the party, Frank attempts to introduce his latest creation, Rocky (played by Peter Hinwood), but the celebration is halted when Eddie (Loaf), Columbia’s beau, comes out of deep freeze. Singing, dancing, and pandemonium ensue.